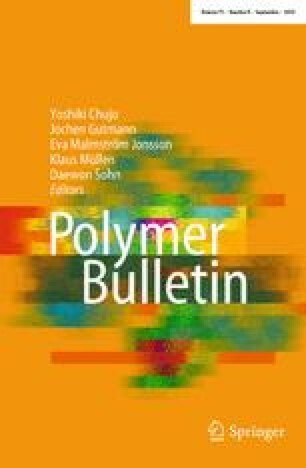 In this paper, the phase segregation and thermo-mechanical properties of energetic poly(urethane–urea) (EPUU) for propellant binder application are analyzed. Series of EPUUs are synthesized from copolymer of 3,3-bis-azido methyl oxetane and tetrahydrofuran, tolylene diisocyanate, and 3,3′-dichloro-4,4′-dianilino methane, with different hard segment contents ranging from 9.7 to 38%. With the enlargement of hard segment content from 9.7 to 28.9% (EPUU1–EPUU3), the percentage of ordered part via hydrogen-bonded C=O in urea increases as investigated by FTIR, further increase of hard segment content to 38% results in less hydrogen-bonded ordered part but more disordered part. The SAXS result also verifies the highest degree of phase segregation of EPUU3. The thermo-mechanical properties of energetic poly(urethane–urea) are related to the degree of microphase separation. With the increase of hard segment content, the tensile strength increases roughly, while the elongation at break drops from EPUU1 to EPUU4. EPUU3 exhibits the highest value of tensile strength and acceptable elongation at break. The online version of this article ( https://doi.org/10.1007/s00289-017-2251-4) contains supplementary material, which is available to authorized users. This research work was supported by the SAST Foundation No. 2015101.